Tulalens, an early- stage social enterprise, was struggling to stay afloat and achieve its original mission of transforming under-served women from passive recipients to knowledgeable consumers. The organization was founded in October 2014 with the goal of crowdsourcing information on the quality of health clinics for pregnant women living in urban slums across India. Between October 2014 and August 2015, Tulalens conducted extensive market research in Hyderabad, India using the founder’s savings as well as funds from a few generous individuals who believed in their work. During this time, Tulalens managed to reach more than 600 women, but was scraping by on less than $10,000. In July 2015, the founder of Tulalens learned about Palladium’s Challenge Fund, and submitted a concept note. The Challenge Fund is administered by Let’s Make It Possible—Palladium’s platform to catalyse and support entrepreneurs, start-ups and innovative organizations. The challenge sought to fund and support projects that aimed to test or demonstrate innovation in development work. It was through this Challenge Fund that Palladium was able to connect with Tulalens, and ultimately help the organization redefine their purpose and improve the health of thousands of women in slums across India. Early- Stage Funding: Early- stage funding is incredibly difficult to raise. Many institutional investors refer to themselves as early- stage funders, which mean they fund organizations only after they have existed for 2 to 3 years. This model of investing often favours founders who have their own wealth to invest, are well- connected, or have access to funding through personal connections and networks. The Tulalens team did not fall into any of these categories, and was only able to overcome this hurdle with Palladium’s investment. The Palladium Let’s Make It Possible Challenge Fund is unique in that they are willing to take risks and fund organizations less than a year old. Focus: As a founder of an early-stage company, it is important to tune out the noise, listen to customers, and build an amazing product for them. Constantly worrying that a start- up will run out of funding detracts from this focus. The Palladium investment allowed the Tulalens team to focus on their customers and hone in on those needs. Experimentation: With Palladium’s investment, Tulalens was able to launch a pilot in Chennai that lasted from September 2015 to February 2016. During these six months, Tulalens incorporated human- centred design to ensure that they were designing a service their customers loved. Through this iterative model, the team was able to figure out quickly what approaches worked and what didn’t. Some of the barriers with the existing model proved so complex, that, in the end, Tulalens decided to pivot their focus. While Palladium’s funding did not lead Tulalens to scale its original project, it allowed the social enterprise to pivot and build something that women both need and want in India. 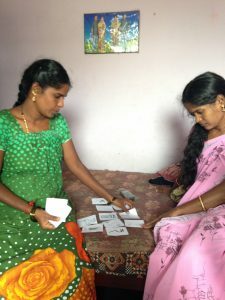 Through additional human- centred design, the Tulalens team identified a major pain point for 11 million women living in India’s urban slums: iron- deficiency anaemia. Their customers are mostly living off rice, consuming less than 600 calories a day while simultaneously holding physically- demanding jobs, trying to have and/or raise children. Because of this, women suffer from headaches, infections, and adverse birth outcomes. However, iron- rich foods are available locally and sold at an affordable price. To remedy this solvable, yet pervasive, problem, Tulalens now equips women with the information, tools, and support to act. The Tulalens team tracks iron intake, shares visual aids with women, and then recommend iron- rich ingredients customized to taste preferences, budgets, and time constraints. So far, Tulalens has already increased women’s iron intake by 250% and calorie intake by 150%. Over the course of the next six months, Tulalens will continue to refine and evaluate their prototype service using the principles of human- centred design. They plan to reach more than 1,000 women and their 3,000 family members during this time. Through Tulalens’ experience, we see the importance of being able to rethink and challenge an organization’s existing models. Without Palladium’s investment and encouragement to innovate, Tulalens may not have been able to shift its focus to the more pressing issue at hand, and ultimately help meet their customers’ needs.